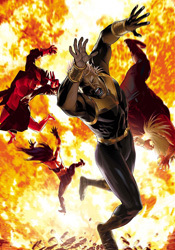 A ragtag cluster of discarded and forgotten characters from around the Marvel Universe, the New Exiles shoulder the task of protecting each planet, reality and possibility in the Omniverse from outside threats. Currently stationed on Earth-6706, (do we really need almost seven thousand replicas of our own reality?) the team has been separated from one another and forced to make sense of this disastrous alternate reality on their own. Before the good-intentioned Exiles have had a chance to gather their bearings, however, the planet's resident Black Panther, an evil woman with an entire army at her disposal, strikes from the shadows. If that opening paragraph wasn't hint enough, this book is terribly complicated. As if the proposition of interacting with one parallel reality wasn't enough, writer Chris Claremont has taken on the task of managing a whole grab bag full of them. And, given his tendency toward convoluted storytelling, he really isn't the ideal writer for this kind of situation. I had to read the first page alone three times over before I had even a vague understanding of what was going on. It doesn't help that he massacres these panels with unnecessary dialog in both thought balloons and lengthy spoken monologues. What are the rest of the heroes doing while the Black Panther stands and speaks, Sue Storm's life in her hands? Are they just listening? Why aren't they trying to save her? While the idea of working with characters so far outside the mainstream continuity should open up nearly infinite possibilities, Claremont instead chooses to use it as an excuse to dispense dozens of mildly different takes on existing characters. Without sixteen ongoing books to tie into, the sky should be the limit for his riff on the Fantastic Four and Namor here, but he still treats them gingerly, like he's afraid he might break them. It's all well and good that Sue and Namor are lovebirds in this reality, but I'm afraid that kind of premise isn't strong enough to carry an entire story arc on its own. Without the benefit of a long history, these characters come of as pale impersonations of their more familiar brothers and sisters, and Claremont does nothing to help them stand out. Tom Grummett's artwork has a few very specific moments of clarity, usually featuring Psylocke, but for the most part comes across as very run of the mill and blasé. Part of that can be attributed to his unenviable task of composing a very specific, detailed battle scene without getting in the way of the endless word balloons, but that doesn't excuse the cast's stiff, boring posturing or his poor consistency. Namor's appearance changes from panel to panel, and Sabretooth looks more like a haggard old reject from the grunge scene than a ferocious warrior. His work with backgrounds and machinery is fairly good, and clearly much more of an emphasis than his character renderings, but that's really a case of too little, too late. This writing stinks, and outside of a few noteworthy exceptions, the artwork follows suit. New Exiles is almost all wrong. Instead of trying new things with familiar faces, Chris Claremont is debating the subtle differences in Atlantean politics between our reality and that of Earth-6706. He's wasting his opportunities to unleash something totally new on the scene by going back to his same tired bag of tricks – pointless battles, unnecessary dialog and dull, repetitive characterization. Tom Grummett, sadly, is just more of the same. His work is uninspiring and drab, without a visual punch or flair for the dramatic. This series isn't worth the paper it's printed on. Skip it.